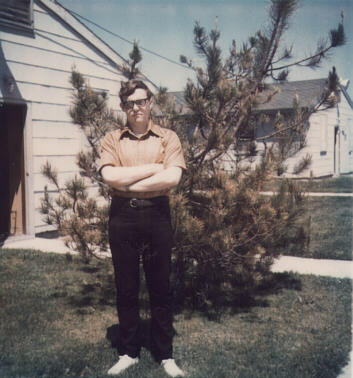 About 3 weeks after my 18th birthday, I was at Lackland AFB in San Antonio, Texas enjoying the balmy July weather with my Uncle Sam paying all expenses. I did my six-week basic training and was sent to Denver, Colorado for my technical school as a Motion Picture Laboratory Specialist. I had wanted to get into Motion Picture Cameraman but this was, after all, the military and I went where they wanted to send me. This was August of 1972 and the Vietnam War was still going on. I found out later that Motion Picture Cameramen were often sent over there and ended up in planes being shot at. Maybe I was better off in the lab. My Layfayette movie camera became a casualty when it was damaged in shipping to me at Lowry, AFB. It wouldn't be until I reached my final destination at Vandenberg AFB in California that I would replace it with a brand new Yashica LD-6 Super-8 camera. The Yashica (which I still own and still works) has a 6 to 1 zoom lens, single frame capability, fader and lap-dissolve function. It's 1.8 f-stop also allowed me get better results from my off-the-screen compositing. The pieces for STAR TRIX were falling into place. For the first 18 months of my stay at Vandenberg, I lived in the old World War II-era barracks on 10th Street. This was fine with me because the Mopic Camera Section was located across the parking lot from my building. When work at the lab was slow, we'd be allowed to leave early and I would haunt Doc Photo whenever I could. The guys who worked there didn't seem to mind but slightly resented my being allowed off while they had to remain at the section all day. Most of them were in their final year of service and preparing demo reels in the hopes of going to LA and getting into the film business. 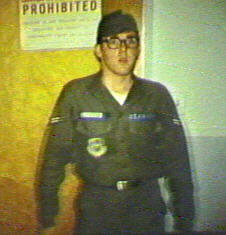 I was even allowed to participate in some of their film projects, one being a Security Police training film. I played the annoying roommate who gets attacked by his partner and saved by the SPs. 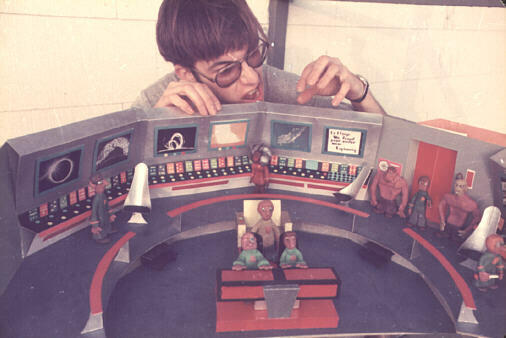 During this time the idea of doing a clay animated STAR TREK spoof in 16mm sound was brought up. I first talked it over with a still photographer friend named Jim Ereaux. He was very adept at model building and constructed the circular bridge set. Jim made it in two separate halves to allow the camera to get into it easily. In January of 1974, work on the sets was progressing nicely when a major setback occurred. With the U.S. withdrawal from Vietnam and the glut of servicemen returning to stateside installations, the Pentagon announced a program of troop reductions. Anyone meeting the eligibilty requirements would be allowed to separate from active duty in a short space of time. The guys who were working with me on the STAR TRIX project didn't have to be told twice. Within a couple of months, they were gone. To add insult to injury, Jim Ereaux had gotten orders for England and left in February. The photos of the sets were taken a day or two before his departure. So I got custody of the sets and models and wondered what I should do with them. Not wanting to waste Jim's sets, I decided to scale back the grander plans for the 16mm film to accomodate my Yashica. 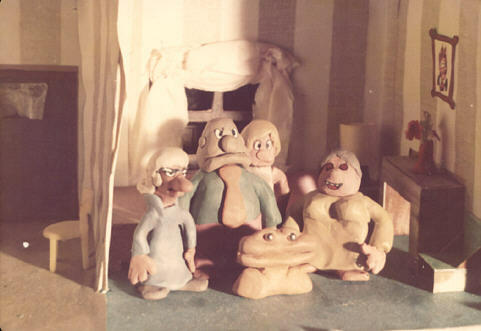 Back in 1971, I had a school project for the filmmaking class (compared to now, it was laughably informal and unstructured) to make a film of no less than 2 minutes of animation. My Lafayette didn't have single-frame capability but one of my classmates had a camera that did. The catch was that I could only have it for one night. I threw together a short film of a grumpy clay group called THE SPRITZER FAMILY. In order to get the project done in one night I took a number of shortcuts where a violent action (explosions, crashes) would rock the camera and I could shoot through them at normal speed. That would eat up time and film and get me to the 2 minute mark quickly. In the summer of 1973, I revived the Spritzer Family for another film and did two more in January 1974. I decided to pair them with the STAR TRIX crew and set to work.